Alfred was born in Newbury on 22 July 1896, the son of William Aldridge, a stone sawyer, and his wife, Martha Jane (née Ayers). The family moved around the town living amongst other places in Wilton Cottages (a yard off Northbrook Street), 58 Bartholomew Street and Albert Villa (19 Albert Road). Of these only 58 Bartholomew Street has survived, where the Aldridges lived from 1898 to 1911. Alfred began his schooling at St John’s Church of England infants school in Newtown Road before moving on to St Nicolas’ School on the corner of Enborne Road and Rockingham Road. He was qualified for what is known as a Kin Scholarship to Christ’s Hospital, Horsham – which means that at least one of his parents was descended from a descendant of a sibling of John or Frances West; in Newbury, this usually means descent from Gabriel Cox, the Mayor of Newbury who welcomed King Charles I to the town on the eve of the 1st Battle of Newbury in September 1643. The Wests were a wealthy but childless couple who left a considerable sum to support student places at Christ’s Hospital for children from Newbury or Twickenham with priority given to their poor kin. Frances West’s grandfather was Gabriel Cox, from whom many Newburians are descended; thus generations of Newbury children have benefitted from the Wests’ generous endowment. The fund is now worth many millions and supplies scholarships for 40 or so students. This may sound a lot, but at the time Alfred received his scholarship there were 42 places for Newbury scholars alone (14 for ‘kin’). So Alfred left St Nicolas’ School on 31 July 1908 and started the next school year at Christ’s. When the 1911 census was taken Alfred was still at school aged 14 – an age when most children of his social group would have left school and started work. When he did leave Christ’s, he got a job as a clerk in the Newbury District Water Company, a white collar job that would have seemed a step up the social ladder for the son of a stone sawyer. When war was declared in August 1914 it did not take long for young Alfred to enlist, and he signed up in Birmingham for service with the Royal Warwickshire Regiment. How he came to attest in Birmingham is not known. Perhaps he had some particular reason to want to serve with that regiment? Perhaps, he was in Birmingham for some reason when he was persuaded to enlist (there were many public meetings that encouraged all the young men in the audience to sign up there and then). Thousands of men enlisted in the early months of the war, leading to the creation of many new battalions of the so-called Kitchener Army. The Royal Warwickshire Regiment formed eight of these ‘Service’ battalions, three from Birmingham alone. Alfred was posted to the 16th (Service) Battalion; the 14th, 15th and 16th Battalions were also known as the 1st to 3rd Birmingham Pals battalions. Pals battalions were recruited from specific localities, largely of groups of friends: mates from school, workmates, sports teams, etc. Following training the 16th Battalion went to France, landing at Boulogne on 21 November 1915 as part of 95th Brigade, 32nd Division. The following month the Division was reorganised by swapping battalions between it and the veteran 5th Division. The idea was to ‘stiffen’ the new troops by mixing them with the veterans (though the 5th Division itself consisted largely of fresh replacements after its mauling in the 2nd Battle of Ypre in the spring of 1915). The 16th Battalion was transferred to the 15th Brigade in 5th Division. The 14th Battalion went to the 13th Brigade and the 15th Battalion to the 14th Brigade - this placed all three Birmingham Pals battalions in the same unit. The 5th Division had taken over a position before Montauban on July 20, the 95th Brigade being in the trenches and the 15th Brigade in reserve. Soon after nightfall on July 22 " A " and " B " companies of the 14th Royal Warwickshire attacked on the left, but were met with a fire of such violence that Colonel Murray at once formed the opinion that nothing could live against it. The attacking companies were immediately cut to pieces, and those few who got within distance were met by a regular curtain-fire of bombs. Another company was sent forward, and two companies of the 15th Royal Warwickshire were brought up in support. But it was presently clear that success was impossible, and all available details had to be collected to reorganise the original line against counter-attacks. The 14th had 4 officers killed, besides 10 who were wounded or missing, and a total of 469 casualties in other ranks. One company of the 15th had also suffered severely through machine-gun fire from High Wood. The other two battalions of the brigade had fared no better, and in the morning they were relieved by the 15th Brigade. On July 27 a fresh attack was made by the latter brigade on the north part of Longueval and west edge of Delville Wood. The attacking battalions were held up, and two companies of the 16th Royal Warwickshire advanced in support. Many of their officers were shot down, and Company-Sergeant-Major Baker, finding himself in charge of two platoons, on his own initiative (having no orders) brought them up into the firing line. Eventually the north end of Longueval village was secured, and as a result of hard fighting in other quarters the greater part of Delville Wood was cleared; the enemy shell-fire had been most intense and the battalion had many casualties. One can only imagine the effect of this week of activity on the morale of the people of Birmingham as they heard of the fate of their Pals. Alfred was killed in action on 27 July, suggesting that he was in one of the two companies supporting their comrades in the 15th Battalion. However, this is not necessarily the case, enemy shell-fire could well have inflicted losses on troops who never left the support trenches; certainly his death was as a result of shell-fire. News has been received that Pte Alfred John Aldridge, of the Royal Warwickshires, was killed in action on July 27th. He was the son of Mrs Aldridge, of Albert-road, and was a scholar at the Church of England Boys’ School. Winning a Kin scholarship, he was educated at Christ’s Hospital, and on leaving, entered the service of the Newbury District Water Company as a clerk, in which occupation he was engaged up to the time of his enlistment in September 1914. The major of his battalion, writing to the mother, expressed his deep sympathy, and said her son was an excellent soldier. He was an efficient bomb thrower. Mrs Aldridge, of Albert-road, Newbury, has received a sympathetic letter in reference to the death of her son, Pte Alfred John Aldridge, recently reported. The Major says: - “He was killed instantly by a piece of shell in his back and was buried decently by his comrades. This was all that was possible under the circumstances – an appalling shell-fire lasting several hours. I am extremely sorry for you in your terrible loss. Your boy was one of the very best men in my old company, and during the whole time he had been in the battalion, nearly two years, he bore an absolutely clean and honourable record. He was most popular amongst his platoon, and his loss is felt keenly by them. As was often the case in this battle, Alfred’s body was not recovered in a recognisable state. While he may lie in an anonymous war grave, his name is remembered on the Thiepval Memorial to the missing of the Somme (Pier and Face 9 A 9 B and 10 B). In ever loving memory of our dear son, Pte Alfred John Aldridge, Royal Warwickshire Regt, who was killed in action in France, July 27th, 1916, the fifth dearly loved son of William and M J Aldridge, Albert Villa, Albert-road, Newbury, aged 20 years. God grant him peace and rest. From his sorrowing Mother, Father, Sisters, and Brothers. 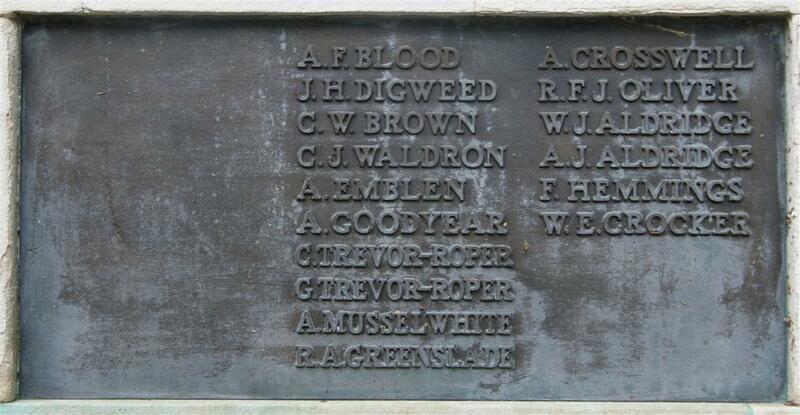 Locally his name is recorded on panel 8 of the Newbury Town War Memorial, immediately below that of his elder brother William who died at sea when the ship he was serving on, HMS Begonia, was sunk in 1917. The brothers are also remembered on the memorial board and roll of honour in St Nicolas’ Church, Newbury.